Once again, we are excited to be launching a new website. Yes, we know, it seems like we launch a new one every year, but through the years, we've learned a lot about the capabilities we need. With each update, we strive to make the site easier to access, navigate, and keep up to date. Ultimately, we're always searching for a more effective way of communicating with festival goers. We think we've found it and we're excited to share the new look and functionality. First off, this site is fully responsive. This means you can view it easily from any computer, browser, tablet, or smart phone. It's not too small for your large monitor, or too large for you smaller screen. We have a news feed! That's what you are reading right now. When newsworthy events happen, we can keep you in the loop easily. Not to mention, you'll know right where to look if you want to hear about recent events or changes to the festival. We'll also be able to use this feature to spotlight members of the community and featured performers. Best of all, you can comment on our news posts and share your thoughts with us too! New Photo Galleries - We always try and share new photos each year through our Facebook page (check it out! ), but it's been a fairly grueling task to add photos to the website. Now we are able to easily add photos videos and other content on the fly. Please let us know what you think, and as always, we look forward to seeing you in June!!! As you many of you are aware, flooding in April of 2013 caused very serious damage to Gebhard Woods State Park. It was with great sadness that we cancelled our 25th festival. We really missed seeing the familiar faces last June and have been determined to get back in the saddle for 2014. Gebhard Woods is our home and we plan to return once it is suitable. However, unfortunately the water damage proved to be more than one year could repair. 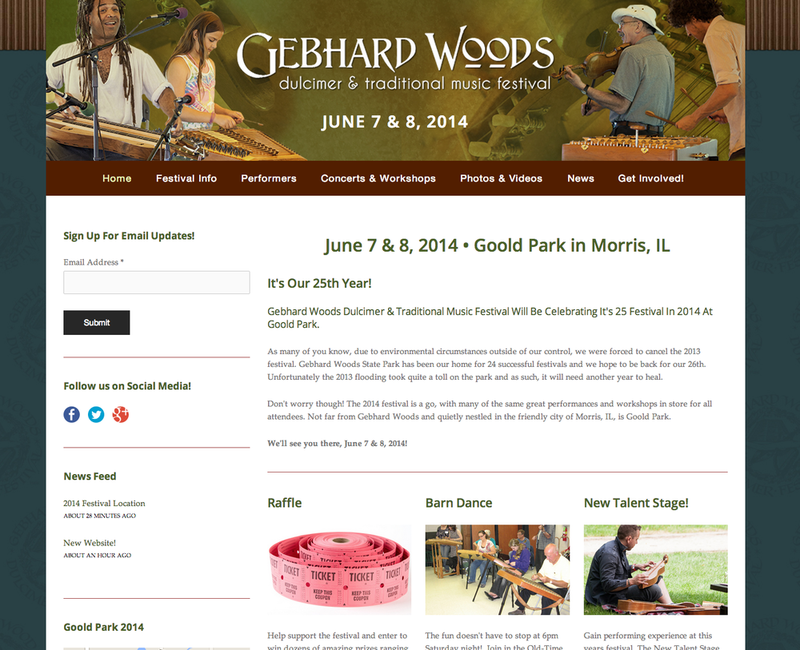 For that reason, the 2014 festival has been moved to Goold Park, Morris IL. Located less than a mile from Gebhard Woods, Goold Park located in the same charming town that has been the festival's home since 1988. Festival dates are June 7 & 8, 2014. Performers are listed on our featured performers page. Concert & Workshop schedules are in the works. If you are interested in performing, sign up for our New Talent Stage!